The words in red especially stood out to me. I feel sometimes that chronic illness and pain is a deep darkness. People all have opinions and judgements about other people's pain, doctors are often confused when diagnosis eludes them. Pain can be very isolating. Pain sometimes feels like night time that never ends and you can't fall to sleep. No one sees what it feels like, no one sees the frustration with tests after tests ... It feels like stumbling around in the darkness trying to find a treatment that works and it feels so alone. BUT GOD SEES. He isn't limited by darkness like we are. What a comfort. Today is the first day of summer and I just wanted to say Happy Summer to you! If you live in the Pacific Northwest like I do you are probably thrilled to see the sunshine today after a long winter of cold and rain. It is important and healthy for us to ENJOY the world around us even when we might just feel like crawling into bed some days. It is important for us to rejoice in the beauty God has given us in nature and in people around us, in music and literature and art. It is not only healthy for us but it also makes us more fun to be around. I don't know about you, but I get tired of being around people who are always complaining or never able to see the sunshine because of the clouds. It is a discipline to look at the beauty in a world that holds pain, but it is possible only because of Jesus Christ. Yes I'm in my PJs ;) This garden is something that makes me smile. I just love it! I love the feeling that I planted these potatoes, peas and brocolli. I love showing my husband what is coming up. I love the feeling of cooking something I have grown from seed. What makes you smile? I would love to hear about what things you are rejoicing in today! I've visited a lot of hospitals in my day. And though the years I have been learning a lot about the right way to deal with sometimes unbearable pain. I think one thing that I have learned is to choose calmness over chaos. When either yourself or someone you love is in physical pain in that moment you have the choice to make: will you allow the fears and emotions of pain take over, or will you choose to be calm and put your (or your loved one's) health and pain in God's hands. I've seen lots of both sides of this example in my time sitting in hospital waiting rooms: the hysterical teenage girl with very real pain - which is probably made worse by sobbing, the drug seeking person who needs to make their pain look very real to get what they want, the calm and pale woman waiting patiently although in odvious pain ... Now I am NOT in any way saying that if someone is hysterical they are faking it at all - but that as much as I can I want to avoid letting my emotions during pain get the better of me. I have noticed that when you try as hard as you can to remain calm while seeking medical care it pays off. Nurses have much more patience with you, and things go smoother, usually you end up being cared for faster and feel better sooner. I'm also not saying that you should be fake and pretend you are not in pain - especially if you are seeking medical care. You should be honest, but calm. How can you choose calm rather than chaos? Trust in God. When you think that everything is spinning out of control you panic. But when you see that God is with you and that He can even use your pain for His glory and your own good it brings calmness and joy. When I was little we lived in a house right on the edge of a huge (well maybe it wasn't that huge but when you are 4 everything is much bigger!) church parking lot. One of our favorite things to do was ride our bikes for hours in that parking lot. 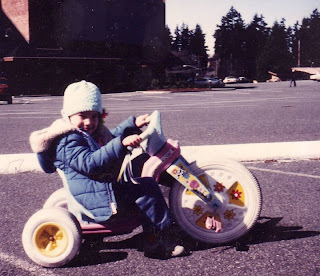 I loved riding on my pink powder puff trike and other bikes which came as I got older. So many happy memories flood into my mind as I think of those days riding with my siblings in that parking lot. But some of the memories that I now look at with affection started out horribly for that little girl I used to be. Falls are pretty much guaranteed with riding bikes, or with running and playing outside. And I was no exception. I skinned my knees more than a couple times, or skinned my palms trying to break a fall. Concrete and gravel hurts! A few things come to me mind when I think of those accidents I had riding bikes or playing outside as a child. 1. Falling is part of learning. I am sure that as I learned how to ride I fell less often, I probably adjusted the way I was riding or watching out for others and avoided frequent falls as I got older. I feel sorry for kids whose parents don't let them learn through falling (or try to protect them to an extreme point) - because I think these lessons are an important part of growing and learning. Even these first lessons in pain are valuble later in life. 2. Sometimes it has to hurt more before it gets better. I remember falling and having pieces of gravel stuck in my hand - as I ran screaming to Mama she held me and comforted me but then did something I couldn't understand at the time, she washed my scrapes and got the gravel out of my bleeding wound. And as if that wasn't painful enough she put Bactene (sp?) on which STINGS on open wounds! What kind of loving Mama would cause so much more pain to a little child who was already hurt!? Maybe this lesson is the most important as I grow up. If God is the loving Father I believe Him to be, could it be that He knows best and maybe the pain I am having is Him cleaning me and protecting me from dangerous things (such as infection in a scrape but so much more deadly things spiritually etc). 3. Compassion. You have to go through some kind of pain to learn compassion. Whenever I see a child with a skinned knee I am taken back to those days and I remember how horrible it felt to get hurt as a child. Something that wouldn't be a big deal now was traumatic as a child. I can show compassion as sympathy to others because of pain I have felt physically and emotionally. After a painful break up (which later ended up to be my Husband!) I had much more understanding and compassion for anyone in that situation. My heart feels that horrible pain of being alone and abandoned and God uses that to touch others who are hurting in a similar way. I have a lot to learn about true compassion, but I want to be willing to allow God to teach me and I see that one way is through suffering of my own. How can God use the pain you might be facing today? Be willing to learn and to have compassion for others.